If you are looking for a day of adventure and an experience that shows you more of the story of henequén and transports you into the natural wonders of our state, visit the cenotes of Cuzamá. At only 48 km from Mérida, about a one-hour drive taking the highway to Valladolid and the exit to Acanceh (if you haven’t had breakfast stop in the mercado), go through the town and you will find Cuzamá. Once you are there you have several options, either to go to the tourist information center or take a motorcycle taxi (typical local transport) which takes you directly to the cenotes. In both cases you can visit different cenotes, for there are now two local co-ops that offer guide and transportation services. On a recent trip, we chose the route offered by the tourist information center, which takes you to the subterranean cenotes of Chacsinicché, Bolonchoojol, and a small cave. The tour is approximately three hours, with 45 minutes at each cenote to take photographs and swim. The cost is for a “truck” for four persons. Prepare yourself to travel on a train track in a form of transport pulled by a horse, and if you are lucky, butterflies will guide your way. Then you will take a motorcycle taxi (included in the same price) in order to continue on your way without rails. Then again you will take another “truck”, and if you meet an oncoming one, you will have to get out in order to let it pass. Now there are seats, but in the past it only had some wooden planks upon which henequén fiber was carried. entry of a circular light and tree roots which practically touch the water, a picture postcard view. If you the intrepid type, you can dive in, for the water is fresh and plenty deep enough (27 meters) for you to show off your skills. If you prefer a more laid-back experience, you can swim or rent a life jacket for 20 pesos. The next stop is Bolonchoojol cenote (“nine drops of water”). Here you also descend by a very steep staircase 15 meters long; be sure to wear non-slip shoes. The cavern is very large and stalactites in formation are visible, and the entry of light permits the view of the beautiful green and blue tones of the water. This is one of the prettiest cenotes in Yucatán. 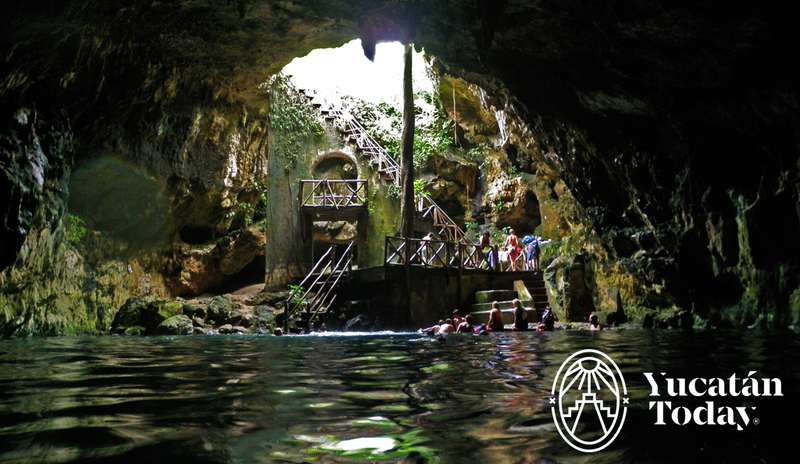 The third and last stop is a cave with a cenote, with very reduced access, only recommended for the most adventurous. Your return is by the same route and transportation method. Now you will probably be hungry, so consider continuing on the Mayapán-Chetumal highway for 24 km to Hacienda Tepich which offers regional food (specializing in rabbit); or on your way back to Mérida you can stop at Hacienda Teya for a delicious “sopa de lima” or “poc chuc”. We suggest arriving early to take advantage of the sunlight and avoid lineups. There are bus departures to Cuzamá from the Noreste bus station (Calle 50 at 67, Centro) at 7:45, 9:15, and 10:45 am, or in colectivos with frequent departures. Explore your adventurous side and “dive” in to these beautiful cenotes! The Parador Ecoturístico is a company that offers the service of access to 4 cenotes, for a cost of $ 500 for a group of 4-5 people. It is open from 8:00 a.m. to 5:00 p.m. It consists of a route in Truck (old transport that are used for transport of Henequén); This tour lasts 2.5 hours approximately. 1.- X’Tohil: The first cenote in the circuit of the route. 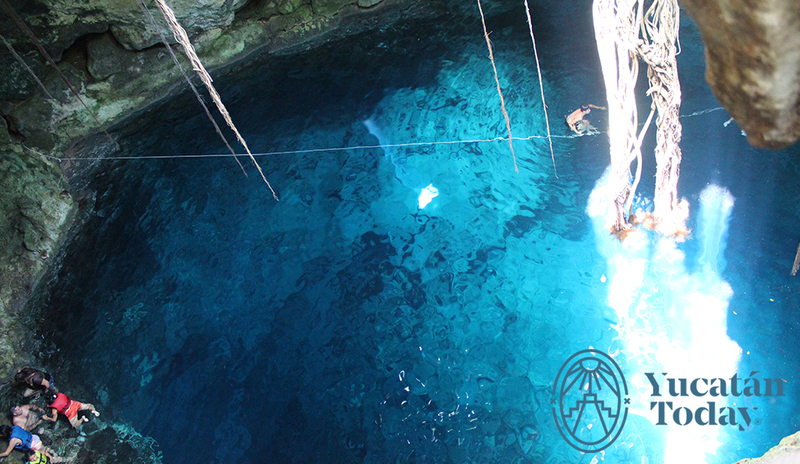 This cenote is cavern type and with a depth of 20 meters. 2.- Ayuso: Cenote type semi-open. With depth of 17 meters. 3.- Sak-Pakal: Cenote cavern type, with depth of 40 meters. In it you can do rope and diving activities. 4.- San Felipe: It is the smallest of all, it is cavern type and the color of the water is completely crystalline.